- This is an intriguing premise which at first puzzled me. The connection between the fabled national hero of Gallipoli, Jack Simpson, and today’s downtrodden Australians seemed contrived. And his ‘invisibility’ to the vast majority of relatively affluent Australians unconvincing. - But as this short book progresses Macauley's intention becomes clear. 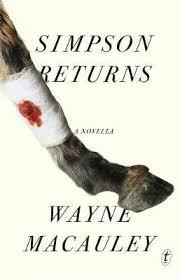 Simpson is just a device connecting a number of stories of hard done by characters who live at the margins and under the radar. Our nation’s indulgence in the myth of the selfless, courageous Simpson, the typical celebrated 'mate' on the battlefield, is self-serving and stands in stark contrast to our ugly reality. - Simpson refers to his ‘Inveterate Samaritanism’. On his slow walk to the fabled 'inland sea' he meets the forgotten and impoverished: the young drug addict; the abandoned suicidal mother; the handicapped goat owner (‘as ugly as a hatful of arseholes’); the unwelcome Afghani refugee; the sexually abused indigenous teenager: the angry and deranged ex-teacher. That he doesn’t really help any of them in any meaningful way is telling. He sees his role as ‘...to administer my poultices and potions, my incantatory fictions, my sideshow bombast and quackery as best I could’. Felicity McLean, The Van Apfel Girls Are Gone.